Silicon heterojunction cells may compete with conventional silicon solar cells for rooftop applications. They are, however, significantly more costly. To compete, costs must decrease and the efficiency of the cells must increase. By applying and continuously improving the Metal Wrap Through (MWT) technology to silicon heterojunction (HJ) cells, ECN managed to spike cell efficiency from an already high 21.5% last October to the current record of 23%. "This is not just another record for a laboratory optimized cell," says senior researcher Gianluca Coletti. "Because of our cooperation with Choshu Industry, our MWT technology is successfully transferred to industry. The record efficiencies are produced by industrially manufactured cells. Heterojunction cells offer promising advantages over conventional silicon rooftop solar panels. They use a large part of the sunlight and suffer less losses while converting sunlight to electricity. Therefore, they can reach the current high efficiencies of over 23%, while conventional panels reach around 19%. Some of the drawbacks, however, include the high cost of the special low-temperature silver paste used for the front connections, and the high cost of the interconnections between cells. A solution for these drawbacks comes from combining HJ solar cells with the MWT technology. With this technology, thin patterns of conducting contacts are created on the front, and current is directly channeled to the back of the cell through a hole in the cell, called a via. This reduces the amount of metal on the front side increasing the usable surface of the cell. It also decreases the resistance of the interconnections. Additionally, smaller unit cells can be created which further reduces resistive losses. Finally, up to 50% less silver paste is used, reducing the cost. 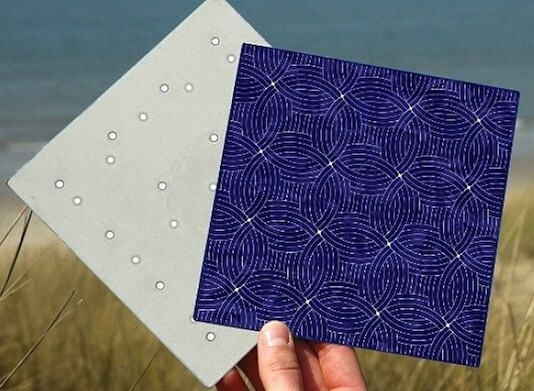 A bonus are the beautiful, customizable pattern designs which can be created, suiting the demand for not only higher power against lower costs, but also appealing aesthetics. One of the latest technological advancements is the use of copper instead of silver for the front and back contacts of the cell. Copper is cheaper than silver and less sensitive to price fluctuations. More importantly, copper plating for front contacts results in a denser material which shows better conductivity than low temperature silver paste. This is remarkable, because silver is usually the better conductor of the two. Changing silver for copper reduced costs and increased the efficiency of the MWT-HJ cell.